Using hand-made puppets and props they created with support from local illustrator and puppet maker, Narelda Joy, residents of BaptistCare Morven Gardens performed a play for students from Blackheath Public School last week. 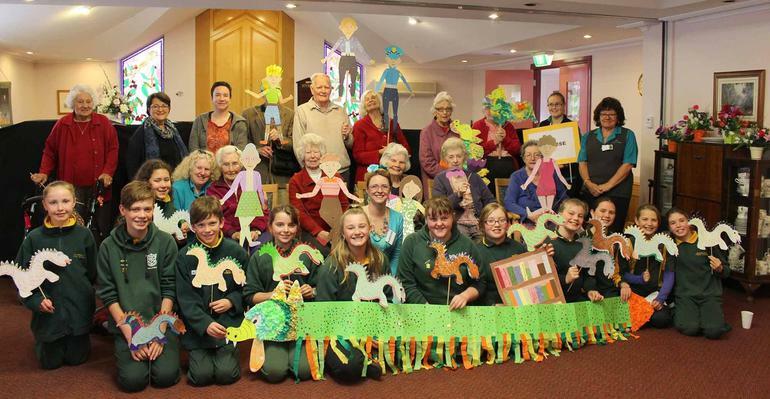 The play, based on the children’s book ‘There’s a Dragon in the Library’, was part of the ongoing calendar of intergenerational activities between the aged care centre and the school, in partnership with the Blue Mountains sub-branch of the Children’s Book Council of Australia (CBCA). Featuring 12 puppets the residents told the story of a young boy called Max, who is the only person that can see a dragon munching and crunching on the library's books. “We are committed to creating opportunities for the young and old to engage in really meaningful ways and to encourage each generation to see the world through each other’s eyes,” says BaptistCare Morven Gardens Lifestyle Coordinator, Nellie Campbell. Ms Campbell says working together with the students on such creative projects gives the residents a wonderful sense of joyful freedom. “It builds self-esteem and helps each participant to feel needed and valued,” she says. Blackheath Public School Assistant Principal and CBCA Blue Mountains President, Sheryl Cootes, says the initiative has been incredibly well received by the school community and the feedback from students has been positive. “I enjoyed talking with people from a different generation,” says Year 5 student Holly.